Murcar Links Golf Club has launched the ‘Friends of Murcar’ campaign to support essential investment in its championship course. The work will help secure the course’s long term future and ongoing role in the development of young Scottish golfers. While the majority of funds raised will be invested in the course, 10% of the final amount will be donated to the Paul Lawrie Foundation which provides opportunities for juniors of any age and background to start playing and competing in golf and fulfil their potential to the highest level. Murcar Links’ Championship course, sitting on the picturesque Aberdeenshire coast, is a stunning and classic test of Scottish links golf, popular with members and visitors alike. Following years of supporting local, national and European golf as a venue and partner, we are at a major turning point for the club as our championship course requires a new irrigation system to ensure we can continue to play a leading role in Scottish golf. We regularly host tournaments of all levels (including the European Tour’s 2015 Saltire Energy Paul Lawrie Match Play and we are joint host of the R&A's 2018 Amateur Championship) and have a particular commitment towards the development of youth golf, so the importance of the irrigation work is ever increasing. Ultimately we are looking to secure the long-term future of our beautiful course and, with it, continue to provide opportunities for young Scottish golfers both financially, through donating 10% of funds raised to the Paul Lawrie Foundation, and practically, out on the course. We have a number of attractive rewards available to donors from across the world and we would love you to be part of the Murcar family and join us on our journey to a sustainable future. Thank you for taking the time to visit us and if you have any questions, please do not hesitate to get in touch via the Contact link at the top of the page. 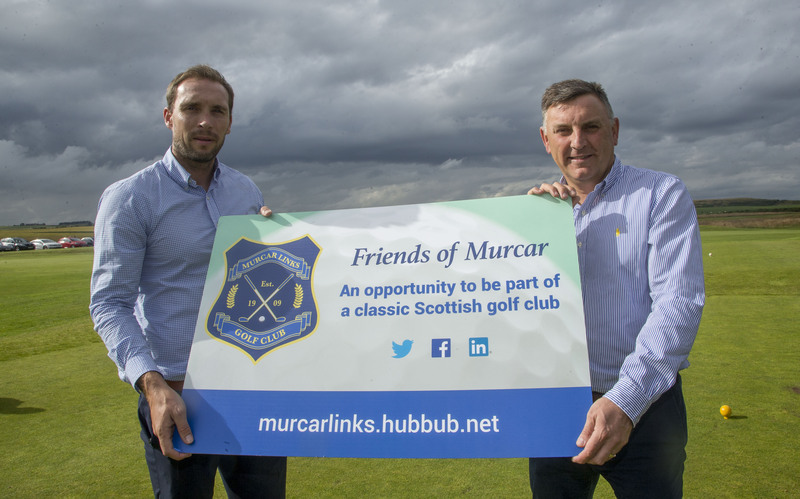 To celebrate the launch of the Friends of Murcar campaign, we're running a special competition where anyone donating £20 or more will be entered into a prize draw to win a round of golf* with Aberdeen FC living legends, Russell Anderson and John Hewitt. The winner (and playing partner), to be drawn at the end of the campaign, will enjoy a fourball with 1983 European Cup Winners’ Cup hero, and Murcar member, Hewitt and former League Cup-winning club captain Anderson, currently an Aberdeen Football Club ambassador and also a regular player at the course. *winner will receive complimentary green fee for two people to play alongside Russell and John. Winner to be drawn at end of campaign. Mutually agreed date of prize round to be arranged after winner notified. Prize must be used by 30 September 2017. As an additional element for the campaign, the team at the stunning 5 star Marcliffe Hotel and Spa in Aberdeen have donated three overnight stays, with breakfast, to be won by donors. - Prize includes voucher for overnight accommodation with full breakfast at the 5 star Marcliffe Hotel and Spa, Aberdeen. - Three vouchers are up for grabs. Maximum one voucher per winner. Stays must be booked in advance by telephone. - Subject to availability. Excludes Saturdays and Christmas and New Year periods. - Anyone who has already donated £5 at time of competition going live will be entered into the draw automatically. EVEN MORE PRIZES UP FOR GRABS! For your chance to win either of these great prizes, all you have to do is donate £10 or more to the Friends of Murcar campaign. Good luck! Full details on Murcar Links Golf Club can be found at www.murcarlinks.com and you can follow us on Twitter @MurcarLinksGolf and Facebook. You can find out more about the great work of the Paul Lawrie Foundation at www.paullawriefoundation.co.uk. Donors of any level will become a 'Friend of Murcar' for life and have their name included on an official commemorative board to be installed at the club. PRIZE DRAWS - Anyone donating £5 or more will be entered into a prize draw to win an overnight stay at the fabulous 5 star Marcliffe Hotel and Spa. Donors of £10 or more will be in with a chance to win a golf lesson package or special Pro-Am experience. Anyone who donates £20 or more will could win a four ball with Aberdeen FC legends, Russell Anderson and John Hewitt. One prize per winner. See Pitch page for full terms and conditions. As well as a place on the 'Friends of Murcar' commemorative board, donors will also receive a sleeve of Murcar Links branded Titleist Pro V1 golf balls (3 in a sleeve). As well as a place on the 'Friends of Murcar' commemorative board and a sleeve of Murcar Links branded Titleist Pro V1 golf balls, donors will also receive a Murcar Links polo shirt by Ashworth and enjoy a free round on Murcar Links Championship Course (for one person). NON-UK RESIDENTS ONLY - Donors will receive a place on the 'Friends of Murcar' commemorative board and a 12 Month International Membership for Murcar Links Golf Club enjoying unlimited golf on Murcar's stunning Championship course and Strabathie nine-hole course. The 12 Month International Membership also includes unrestricted access to the driving range and practice area along with unlimited guest introductions at 80% discount on green fees. Donors will receive a place on the 'Friends of Murcar' commemorative board and a 12 Month Membership for Murcar Links Golf Club enjoying unlimited golf on Murcar's stunning championship golf course. Donors signing up for a 12 month membership will also receive a dozen (12) Murcar Links branded Titleist Pro V1 golf balls, Murcar Links polo shirt by Ashworth and a complimentary golf lesson with the club's PGA professional. NON-UK RESIDENTS ONLY - International Life Membership. Donors will receive the same benefits as the 12 Month International Membership (see above), along with complimentary golf for their spouse/civil partner while playing together, unlimited free balls on the driving range and a range of club merchandise including Murcar Links branded Titleist Pro V1 golf balls and Murcar Links polo shirt by Ashworth. NON-UK RESIDENTS ONLY - Premier International Life Membership. Donors will receive the same benefits as the International Life Membership (see above), along with a personal club locker, 50% discount on beverages in Murcar Links clubhouse and one round each year on the Murcar Links Championship course with the club's PGA professional.